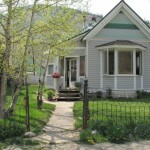 This is a charming, quaint, 1897 Victorian home located in a very desirable neighborhood in Silverton. It is nice, quiet, and has amazing views and mature shade trees. The home is a contributing property to the Silverton National Historic District. The home is one block from the shops and restaurants. It sits adjacent to Cement Creek and Memorial Park (tennis courts, playground, gazebo, and fields) and is within a short walking distance to Durango and Silverton train stop. The home features a private fenced in yard with manicured lawn and edible gardens, picnic table, grill, and outdoor lawn seating.